This week, Cpt. Radford and Lord Shiteingale discuss the trials and tribulations suffered at the hands of Sir, You Are Being Hunted, the indie-dev stealth game with an aristocratic twist. Join them as they argue as to whether this robotic game of hide, seek, and destroy, is joyously Rad or disappointingly Shite. 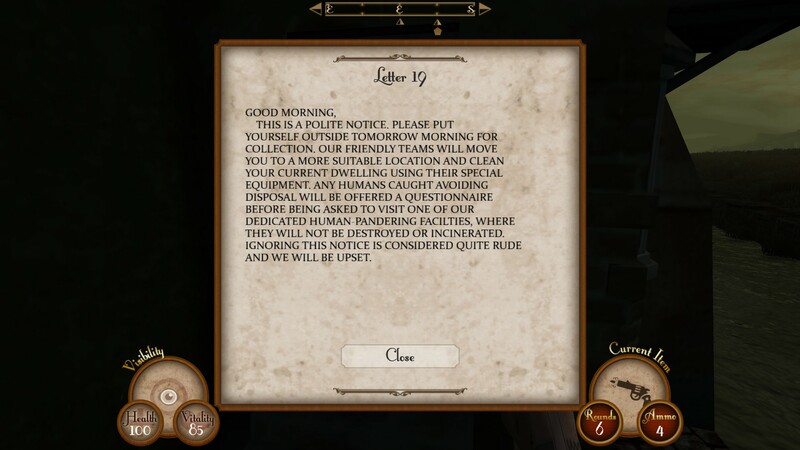 Before we begin the debate over whether this game is worthwhile or not, allow me to give you some information about Sir, You Are Being Hunted, so the Lord and Captain can get on with their usual ruckus without getting sidetracked on basic details. Sir, You Are Being Hunted (henceforth SYABH) is a game from Big Robot Studios which is set in a five-island archipelego to which, you, Sir or Madam, are accidentally transported following a mishap with an experimental Device. Your Butler is still able to communicate with you, however, and instructs you to find various fragments of the Device which have been scattered around the islands. However, it is not as simple as finding and fetching: moustachio’d robots, clad in tweed and wielding shotguns also roam the isles, seeking squishy humans, and their intentions are not to invite you to tea. Your goal is to collect all the pieces of this Device, whilst avoiding the increasingly variable and tough robots that have taken up residence. Stealth is the name of the game, but combat also plays a significant role. You must do anything to survive and escape. Let’s start with the basics shall we? The “plot”, if one can call it that. Radford, I can’t believe you would waste your time on such nonesense. This game can’t be anything except complete tripe. Robots, hunting men, while wearing false moustaches and smoking pipes, all whilst the player scrabbles about for pieces of some demented Device (capital D and all). I’ve never heard such inane stupidity. How would robots even smoke pipes? They don’t have any lungs! That’s precisely the point, Shiteingale. It’s unique. These ideas have not borne fruit before, or at least not in the same way. We’ve had plenty of tales about robots turning on humanity, but never one that has done it in such a wonderful way: what is there not to love about being chased about by Victorian robots? The premise is simple, admittedly, but the world itself requires a certain level of reading between the lines to fully understand. You can find books and letters in the abandoned houses, which reveal more about what has happened on the island. Their contents are equal parts humorous and chilling. Humorous and chilling? It seems to me that this game doesn’t really know what it wants to be. In my experiences, there was a lovely atmosphere of thrilling terror, with crows cawing and distant silhouetted robots sending shivers down my spine. 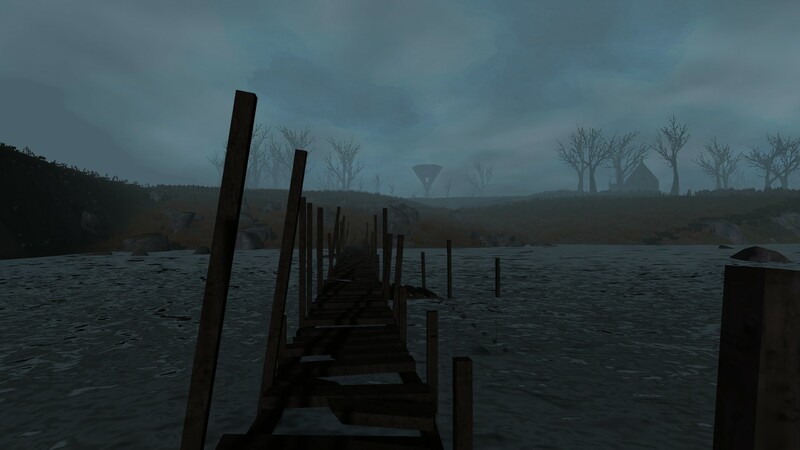 Particularly at night, I found myself so convinced by the procedurally-generated environment of the moors that I expected Heathcliff to come striding out of the fog at me. Indeed, there are some very Wuthering Heights-esque mansions dotted about the landscape! Just when I was ready to enjoy a tale of terror, I encounter some silly letter emulating one of the modern spam messages. It’s a complete mood killer! But you liked the environment? Oh, absolutely. 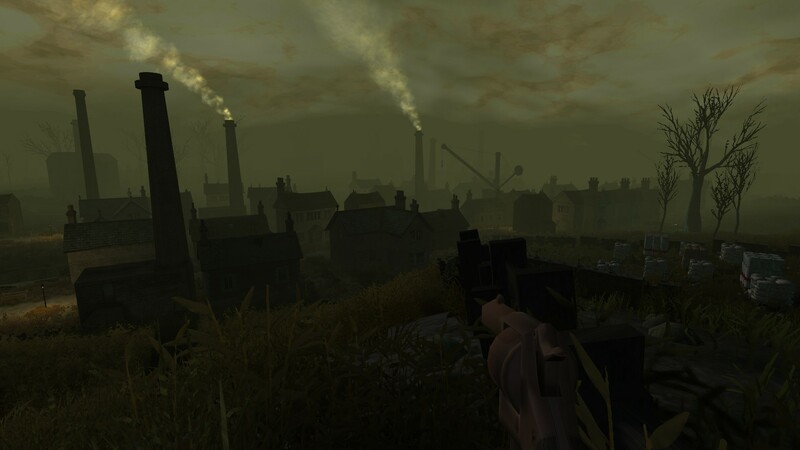 The English countryside was very convincing, the murmuring chatter of the robotic hunters that mimicked the gentry was surprisingly scary, even if the content of their discussions was silly, and while the graphics were not what I would call next-gen, they had a wonderful style to them that definitely contributed to the atmosphere… though what the atmosphere was intended to be is rather unclear. Excuse me for interrupting Radford, but I thought this was supposed to be a stealth game? Quite so! You can hide in tall grass or vegetation exceedingly well, and there are several items which can be used to distract your pursuers away from your location, including a darling little steam-powered train set that they chase after like dullards. It’s not all just foggy countryside: the cities are also particularly impressive. Then why such a focus on weaponry? You mentioned an axe, a pistol, a rifle, and I know for a fact there is also a shotgun as well. Surely a stealth game should be having you hiding, not charging out guns blazing! Especially as the rather vague ‘Butler’ even says that running away is the best idea, and violence is “best left to the professionals”, or some such. How can the developers give such advice but then hand out so many powerful weapons? Speaking of the tutorials, I found them, such as they were, to be rather lax and not at all explicit as to the uses of some items… though I suppose you will argue that is the point. I do! It’s a game that places a lot of focus on discovery and experimentation. Near the start of my playthroughs, I did find myself running away a great deal from the robot horde, flitting from hamlet to hamlet, desperately trying to find an axe or a pistol or something to defend myself with. The first few minutes are very much a hide or flight experience. But once you do have weaponry, you can fight back, but even then you have to be very careful about your resources and ammunition. If you die, the savepoints allow you to take a small progress hit in order to return to your previous save: the save points are few and far between, but the fact that they exist at all encourages experimentation with strategies. Quite. But I argue that the simplicity of the items and weaponry limit your strategies. You can shoot the robots, you can hide from them, you can trap them or you can distract them. Those are really your only options, and every strategy eventually is based around the use of one or two items, like your alarm clock, mantrap and axe. It’s far too simplistic, and hardly stealthy. It’s more about setting up an upcoming fight so that you are going to win rather than avoiding the fight entirely. In addition, I found that after several playthroughs, my strategies began to hinge on me having certain items. Perhaps I am merely uncreative, but I spent a long time simply trying to find a few traps, rushing about the countryside and not having very much fun at all. Not even in the “I’m going to die” sense of fun, it was just dull looting every building I saw. The visuals are lovely, but even they get repetitive after a while. 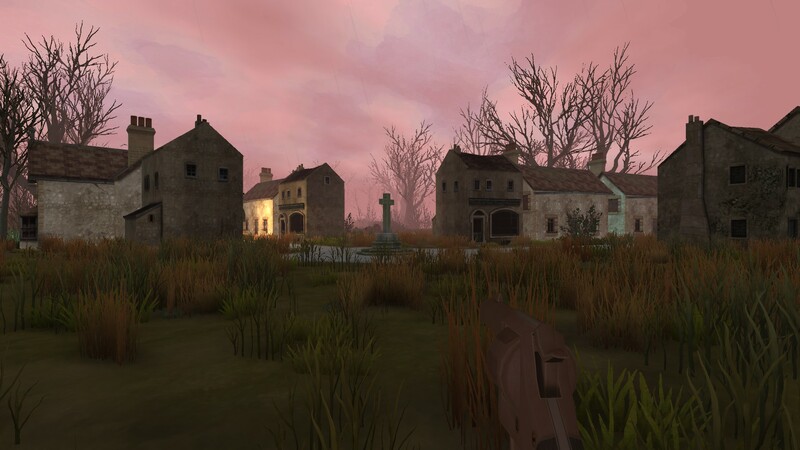 To summarize, I think Sir, You Are Being Hunted is not the most shite game I’ve encountered, but it certainly fell very short of where I would have liked it to be. The strategies were too simplistic, the atmosphere switched between funny and scary far too often, the plot was very basic and was not well explained and frankly I find the idea of robots overcoming the country gentry to be offensive to my core. As always Shiteingale, you are entitled to your opinion, but I am entitled to disagree! This is an absolutely rad game, and I very much enjoyed playing it. The heart-thumping chases from the robots, the teeth-gnashing anxiety of whether your ambush will work, and the sheer mystery of the island and its previous inhabitants makes this game not only worth playing, but worth playing over and over! Good show Big Robot, I look forward to your next endeavour!